To the echoes of an adoring fandom, Tom Brady spirited himself away from the Salem State stage Thursday night and returned to his cone of silence. But as the Patriots superstar took refuge from the Deflategate storm, he found a way in absentia for his voice to pierce the din. Yee’s media blitz is aimed both at protecting Brady’s multimillion-dollar brand and rousing public support as the clock ticks toward the unspecified moment when the NFL announces its punishment for Brady’s alleged transgression. Yee defended his client and said he was surprised by the findings of the report. He indicated in an interview with the Globe’s Christopher L. Gasper that he should have immediately responded more aggressively to assert the quarterback’s innocence Wednesday after the report was released. Nearly 24 hours passed before Yee launched his media offensive in earnest. “I think that’s my fault because I was just so focused on a statement on the infirmities of the report,’’ he said. He may lack Brady’s charisma, yet Yee struck a rhapsodic tone in the The Sports Hub interview as he did what Brady has been unwilling to do since the report popped: pledge support for embattled equipment staffers Jim McNally and John Jastremski. The pair allegedly conspired to improperly deflate game balls to Brady’s preferred air pressure before the Patriots trounced the Indianapolis Colts, 45-7, in the AFC Championship game en route to the Super Bowl. A Los Angeles-based attorney who teaches part time at the University of Southern California and University of Virginia law schools, Yee is better trained than Brady to parry the procedural questions raised by the 15-week investigation that led to the Wells report. Brady faces a possible suspension of one or more games next season. In one stop after another at an alphabet stew of media outlets — CNN, MSNBC, ESPN, and NPR among them — Yee has portrayed Brady and his ball-boy buddies as misunderstood victims of a well-intentioned inquiry gone bad. Yee tells everyone who will listen that Brady prefers the air pressure of his footballs adjusted to the league minimum of 12.5 pounds per square inch. But Yee insists Brady had no idea that anyone surreptitiously took air out of the balls before the AFC title game, as the Wells report alleges McNally probably did. However, Yee has eschewed the pitbull tactics that other lawyer-agents might employ. Brady was playing football at the University of Michigan in the late 1990s when Yee began recruiting him as a prospective client. 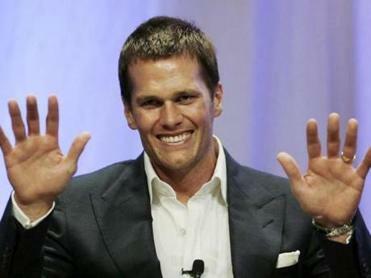 Yee told Sactown Magazine in his hometown of Sacramento he met Brady’s father, Tom Sr., during Brady’s senior season. Yee said he sat down only once with Brady — after he led Michigan to an overtime victory against Alabama in the Orange Bowl — before Brady chose Yee and his partner, Stephen Dubin, to represent him. Yee said his mother, who speaks only Chinese, has become such a fan of Brady that she writes him fan mail in her native language, which Yee translates for his client. Brady needs all the support he can muster as the NFL weighs disciplining him. To that end, Yee has worked almost nonstop since Wednesday, playing a much more active public role than he did when one of his other major clients, New Orleans Saints coach Sean Payton, faced a full-year suspension in 2012 after members of the Saints organization allegedly offered financial bonuses, or bounties, to players who injured opponents during games. In Payton’s case, Yee said little publicly, other than announcing an appeal of Payton’s suspension, which proved unsuccessful. In Brady’s case, Yee has been ubiquitous. Time and again, he has suggested that Wells drew faulty conclusions about Brady and the equipment staffers based on thin evidence that easily could have been interpreted to exonerate them. He asserted in the Globe interview that Brady has been hurt in “the court of public opinion’’ by Deflategate media leaks since the story first broke after the AFC title game. Yee is on a mission to stem the damage — even if it may impact another of his clients. Yee also represents Patriots backup quarterback Jimmy Garoppolo, who would likely start the team’s opening game next season if Brady were suspended. The opportunity would be special for Garoppolo, who has yet to start an NFL game. But Yee wasted little time when Dan Patrick asked which of his clients he expects to start in the Patriots opener.